Trusty Makes A U-Turn - A lesson in obeying instructions. 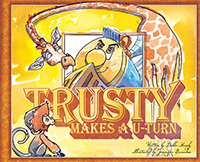 Trusty Makes a U-Turn is part of the Children's Collection. Trusty has every intention of obeying instructions. His job is to transport the zoo animals to their natural habitats–and to be on time! But they're getting restless, and in order to please them, Trusty gives in to pressure. Sad to say, they all feel the consequences of this big mistake! From Nicole Causey of Myrtle Beach, South Carolina on 3/4/2019 . We have ALL the Trusty books and our 7 year old boy and 3 year old girl love them. It is good to be able to fill our children's minds with words such as these. Thank you! From S Lamb of Gibson, Georgia on 1/2/2019 . I have purchased all the Trusty books for my grandchildren. They love them.